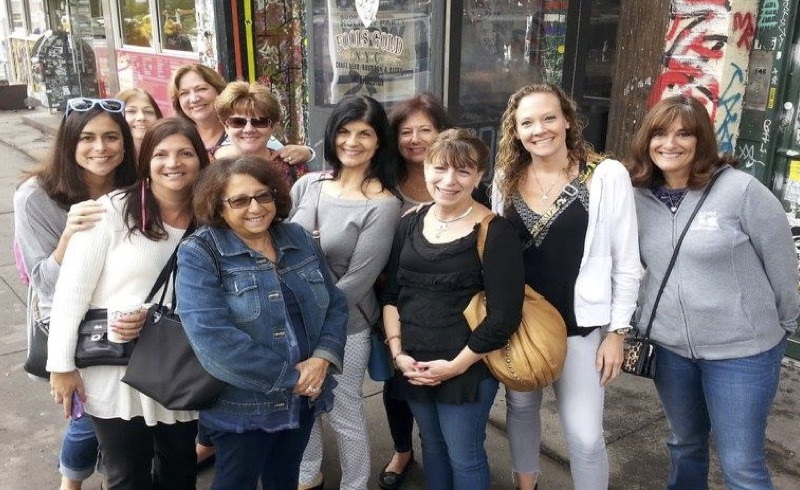 Friends and Food by Gina Cortina – Half Hollow Hills Teachers Association | Love what you do. The HHHTA held its 3rd annual Walking Food Tour on Saturday, October 14, 2017. The tour covered the Lower East Side of Manhattan and began on East Houston Street. Our first stop was Yonah Shimmel's Knish Bakery. It opened in 1910 and is still going strong. Not only were the knishes delicious, on offer were also dessert knishes! Our next stop was a Punjabi deli that served many interesting delicacies. Popular with NYC cabbies, they suggested we tried the samosas, which were outstanding. As we walked down the street, we passed the famous Katz's Deli. A true landmark, it was very crowded as usual. Russ and Daughters was another spot on our tour. It was packed with many tourists who were waiting for a bagel with a schmear. The Pickle Guys lived up to its name with too many pickles to choose from. As we travelled and ate our way through the Lower East Side, our tour guides provided us with the history of this amazing and diverse part of New York. At the end of the tour, our members had the opportunity to explore on their own, visiting the many wonderful establishments in the area. My group made our way to Little Italy for gelato at Ferrara's. As the day came to a close we all agreed that a fun-filled, food-filled day was had by all!